… on my head and just about everywhere else at Wapping on our first early morning at Wapping Old Stairs. For the first time in history, the TDP were rained off site. 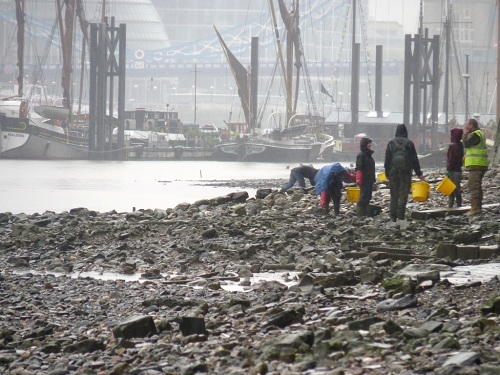 For the fieldwork in Tower Hamlets, there were low tides on late Wednesday evening and early on the following mornings. It doubtless seemed a workable schedule during our sunny dry Spring, but things did not quite work out in the face of unfriendly weather fronts. The first TDP rendezvous was at 7pm. It fell to yours truly to give the guided tour, since I have been involved with Wapping since the original Thames Archaeological Survey. 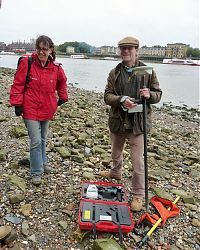 Members of the City of London Archaeological Society were assigned zones east of the Tower and enjoyed themselves so much that we did further fieldwork for a number of years. Wapping began life in the 16th Century as a ribbon development of lodgings and businesses along the narrow, irregular street, parallel to the river that became Wapping High Street. Its 17-18th Century story is of a busy, socially mixed area servicing ships, sailors and all the trades associated with handling cargoes from Britain’s burgeoning overseas possessions. As ships got bigger the boat building and repairing activities moved down-stream. In the 19th Century, the Wapping river front became an almost continuous row of large warehouses. Meanwhile, inland Wapping was hollowed out to make the London Docks, opened in 1805. Thereafter there was a long period at the heart of London’s docklands, which came to a relatively sudden stop around 1970, with containerization and the expansion of Tilbury Docks. Those Wapping warehouses spared by the Blitz, stayed shut up and empty until they were rediscovered by a new generation of property developers. 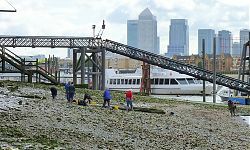 The Wapping foreshore is a post-industrial landscape. 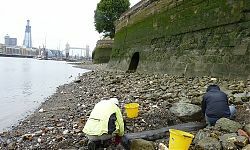 Its most obvious historical features are the stairs and causeways used by those who worked on the foreshore, together with barge-beds and the remains of jetties that served the warehouses, together with abundant scatters of old ships’ nails and an actual mound of pot sherds. Two historical locations in the zone (FTH04) have a wider significance; the HQ of the Met’s River Police, who were set up in 1798 to combat theft from ships moored in the Pool of London and who are still at the same address. The other is Execution Dock, where those condemned by the High Court of Admiralty were hung. It is not true they were all pirates, most were murderers or thieves. The hangings took place near what is now known as King Henry’s Stairs, the exactly location subject to on-going research. 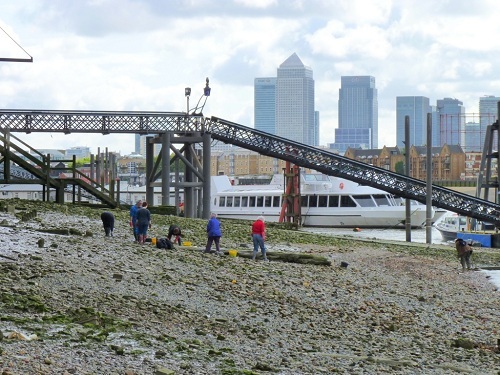 The oldest feature in the zone is near Wapping Old Stairs, the remains of the entrance to Gun Dock, a dry dock first recorded in 1684, which survived until 1889. The history tour over, dark clouds were looming, so the party decided to check out another important historic landmark, The Town of Ramsgate pub. Thursday morning was grey when we assembled at 7.30am, drizzle soon began and got heavier, until work was abandoned. Alas too early for the pub to be open. However Thames Division took pity on us and let us drip in their private museum. This is a former carpenters’ workshop crammed full of over 200 year’s worth of rare memorabilia, which is normally only open to pre-booked parties and on ‘London Open House Weekend’. Go soon if you have the opportunity; like much else, it is threatened by cost cutting. 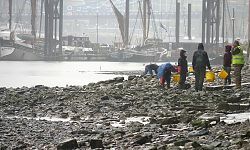 TDP had better luck with the weather on Friday and participants were soon hard at work cleaning some of the more interesting timbers, including a enormous tree trunk (above) by Wapping New Stairs that Eliott said was the largest he had seen on the foreshore. 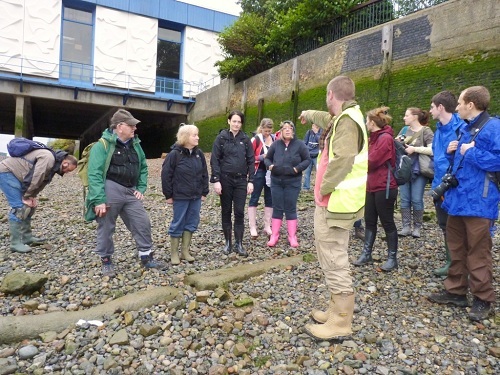 This zone is generally suffering from foreshore slumping, so a number of new features were seen, including a timber pipe drain made of hollowed out elm. Meanwhile surveyors from MoLA where moving efficiently along the zone taking measurements and hammering in stakes. 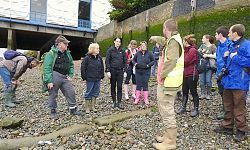 The weather held again for Saturday, when we shared the beach with a mud-larks club outing, who were introducing some novices to the joys of foreshore foraging. Much measuring and drawing was done by TDP before halted by the incoming tide, after which a number took the train through Marc Brunel’s historic Thames tunnel from Wapping to Rotherhithe to fraternise with a TDP party who had been working on the south bank. Sadly I cannot report on Sunday, as I was elsewhere, but I hope those who came to Wapping enjoyed the experience and will come again. Should COLAS, as is likely, continue its stewardship of this fascinating stretch of the Thames we would be very happy to see any TDP volunteers who have developed a taste for Docklands history.